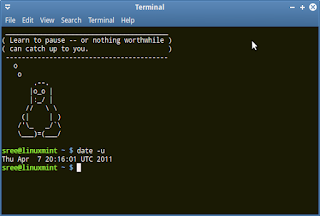 My Sys Admin Diaries : How to view UTC/GMT time in your terminal? In this post we will see how to view the UTC/GMT (Coordinated Universal Time/Greenwich Mean TIme) in our terminal. We will be living in different time zones and we are using Greenwich Mean Time as the standard time to calculate time in other time zones. For example, I'm in Indian Standard Time and it is 5.30 hours ahead of GMT. So it is very common in internet to use UTC/GMT as a standard to tell about the time as people are in different time zones. So what if you do not know the time difference between your time zone and UTC/GMT? We can find the UTC/GMT time from the terminal itself. 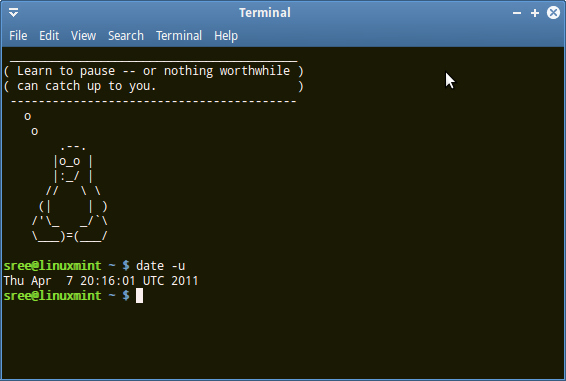 For finding the UTC/GMT time type the following command in the terminal. That's it. There is no need to search in internet to find out that.